The End of the War: Starting Home reflects Horace Pippin’s traumatic wartime experiences. The artist started working on this painting nearly fifteen years after he returned to the United States from serving in France in World War I. Wounded in his right arm while fighting as a member of one of four African American regiments to see combat, Pippin had turned to painting to help his process of recovery. This image of combat, fear, and surrender condenses terrifying episodes he had documented in his wartime journals—events he later said “brought out all the art in me.” The frame, which shows weaponry and helmets, further heightens the poignancy of Pippin’s depiction of the human dimension of war. Self-taught artist Horace Pippin started working on this painting of a World War I theme nearly fifteen years after he returned to the United States from serving in France. Wounded and paralyzed in his right arm while fighting as a member of one of four African American regiments to see combat, Pippin had turned to painting to help his process of recovery. But it was not long before he went from the obscurity of his home in Chester, Pennsylvania, to wider fame. He developed a circle of devoted collectors including the controversial Philadelphian Dr. Albert C. Barnes. The untutored quality of his pictures was celebrated for its affinity with the concerns of modern artists in the 1930s, and four of his paintings were shown at the Museum of Modern Art, New York, in the 1938 exhibition "Masters of Popular Painting." The End of the War: Starting Home reflects the artist's traumatic wartime experiences, events he later said "brought out all the art in me. "1 This archetypal image of combat, fear, and surrender condenses tragic and terrifying episodes he had documented with drawings and accounts in his wartime journals. At its center a German soldier with raised arms is confronted by a bayonet-bearing soldier. The foreground presents other dramas: a lone soldier falls, wounded, amid numerous one-on-one confrontations while several soldiers seek safety in the trenches and forest from the threat of hidden enemy troops and barbed wire. By contrast, the vast scale of mechanized modern warfare is emphasized in the images of crashing, burning planes and multiple bombings along the distant horizon. The surface of the picture is so densely built up that it has taken on the qualities of three-dimensional relief. 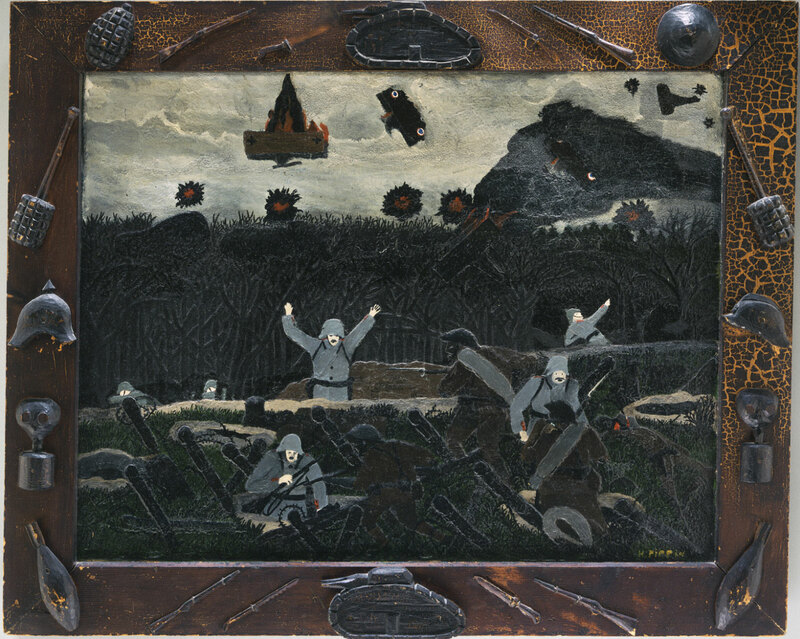 The artist's hand-carved frame, which shows French, British, and German weaponry and helmets, heightens the poignancy of Pippin's depiction of the human dimension of war. Twentieth Century Painting and Sculpture in the Philadelphia Museum of Art (2000), p. 72. 1) Undated letter from Horace Pippin, Horace Pippin War Memoirs, Letters, and Photographs, Archives of American Art, Smithsonian Institution, Washington, D.C.; quoted in I Tell My Heart: The Art of Horace Pippin, by Judith E. Stein (Philadelphia: Pennsylvania Academy of the Fine Arts, 1993), p. 3.